You may know her better as Things That Sparkle, but my talented friend Alex Berlin made it to the cover of this month's Chicago Home and Garden magazine! And yours truly has the styling credit for this cover shoot (recognize that lovable grey pouf?). It was such a fun day and so surreal seeing Alex's beautiful home in the pages of our beloved city publication. Make sure to pick up this month's Chicago Magazine - you'll find CHG as a special insert into this edition! Here are a couple behind-the-scenes shots from the day. I told you before, it's never as picture-perfect off-camera. Yes, you are seeing a couch in the kitchen. 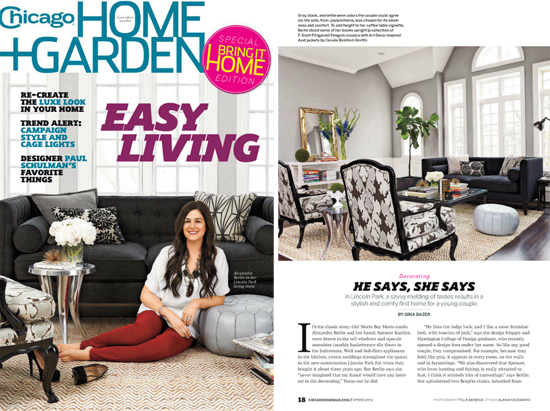 So thrilled to see Alex on the cover- her home is absolutely gorgeous and you did a fabulous job with the styling. Very happy for you both! So funny. When I was getting ready to take photos of my apartment, my friends came over and there was stuff EVERYWHERE and they were like "I thought you were getting it ready to take photographs...?" Im so excited for both of you to be featured in the magazine! How surreal that must be. Alex and her home are beautiful. I was SO excited when I saw this yesterday! You did a great job styling- Alex's home looks gorgeous! just saw this in the magazine yesterday... nice job! 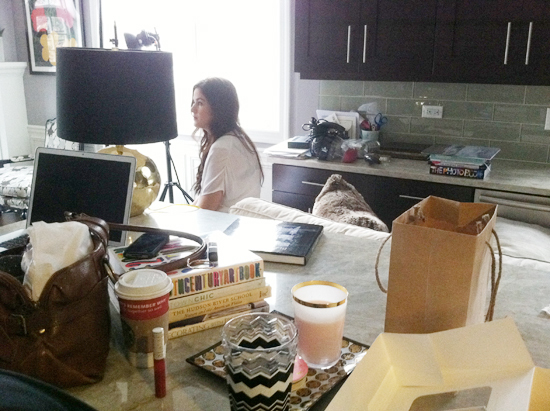 I love seeing the behind the scenes - as perfect as rooms seem on camera (and beautiful! ), I love seeing what it takes to get there! I loved seeing her place, so gorgeous! Great styling job Alaina! and behind the scenes shots are always fun!